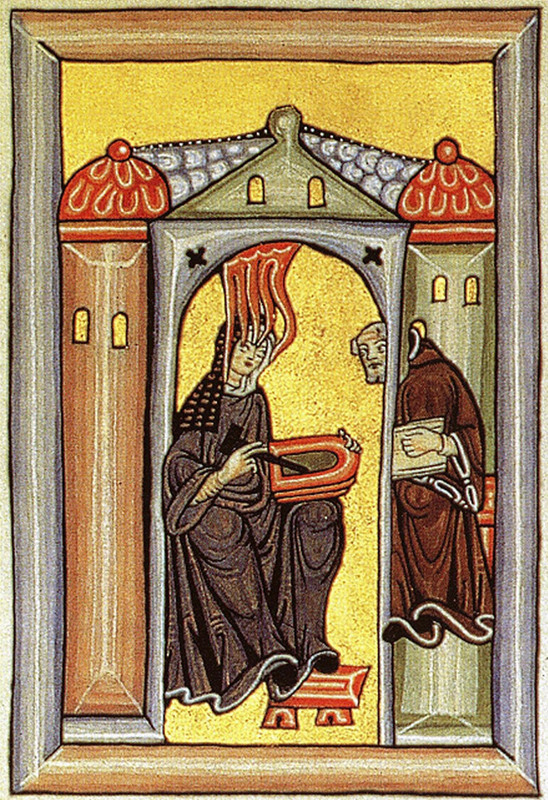 The later canonized Hildegard of Bingen (1098-1179) experienced in her childhood visions of Christ and entered early in the Monastery Disibodenberg the Benedictines. She was very versatile and worked as an artist, scientist, mystic, non-medical practitioner and poet. Around the year 1150 she left the monastery Rupertsberg at the mouth of the Nahe in the Rhine Bingen built and settled it with 18 nuns. This was destroyed in 1632 during the Thirty Years' War. The today individual layers Abbey Rupertsberg, Hildegardisbrünnchen and Klosterberg in the district Bingen-Bingersbrück in the growing area Near remember that. As the second existing monastery, she founded Eibingen in 1165 on the other side of the Rhine above Rüdesheim. Hildegard sent there nuns from Ruppertsberg and led both monasteries. After old tradition of Benedictine Order wine was also cultivated by the nuns. Hildegard von Bingen knew from childhood about the wine and described it as "blood of the earth". It praised its cleansing effect on the blood, juices and vessels of man and says: "The wine, moderately enjoyed, heals and delights man deeply by his great power and warmth . " Her main medical work was "Causae et Curae" (Causes and Treatment of Diseases), which appeared around the year 1150. In it numerous diseases and their treatment are mainly described by medicinal herbs, which are often added to their recipes with wine. For stomach ailments Hildegard recommends a drink from plant extracts and two-thirds of wine, which is heated to drink on an empty stomach, and Christmas rose wine (therefore this plant is also called wine flower ). She also describes many recipes for heart wine, cough wine, Wundwein, cleared wine and vinegar against various diseases and mental problems. Hildegard von Bingen rel. Weingenuss : "Noble, strong wine unjustly excites the veins and blood of man and pulls all the moisture that is in man, as cleansing potions do, and forces the urine to flow at the right time. Hungarian wine does not do that. Therefore, strong wines have to be tempered by bread put into it or by an addition of water. Hungarian wine (Hunnischer wine) does not need to be so tempered; but if one wants to do this, or bread, and drink him like that, then he is more comfortable to drink, but not healthier . " She advises to drink wine or beer instead of water in winter. This page was last modified at 21 February 2019 at 08:44.